Who’s More Likely to Beat Donald Trump — Hillary Clinton or Bernie Sanders? Hillary Clinton holds a 12-point lead over Bernie Sanders nationally, but in a hypothetical match-up against Donald Trump, Sanders does much better than the current Democratic front-runner. As Ted Cruz and John Kasich exited the Republican primary race last week — making Trump the party’s presumptive nominee — Clinton and Sanders have used Trump’s candidacy to argue that they would be in the best position to defeat him in the general election in November. When respondents in our NBC News|SurveyMonkey Weekly Election Tracking Poll were asked whether they would cast a vote for Trump or either of the Democratic candidates still in the race, Sanders is the favorite over Trump by 13 points. Clinton also beats Trump, but the race is decidedly closer — 49 percent to 44 percent. These results are according to the latest from the NBC News|SurveyMonkey Weekly Election Tracking Poll conducted online from May 2 through May 8 of 12,714 adults including 11,089 registered voters. Though about a month remains until the last Democratic primary in June, Sanders trails Clinton by a significant number of delegates, making Clinton the strong favorite to win the nomination. The data from the hypothetical head-to-heads thus provides a window into which groups Clinton needs to sway in order to defeat Trump in the general election in November. Though blacks, Hispanics, women and moderate voters consistently support either Democratic candidate when faced with Trump as the Republican alternative, there are two significant groups that Sanders wins over by much larger margins than Clinton and help him beat Trump by double digits: Republicans under 30 and Independents who do not lean toward either party. There is no question that Sanders has consistently dominated Clinton among Democratic voters under 30 throughout the primary season. When analyzing the data from our weekly tracking poll, however, it appears his appeal among millennial voters crosses party lines as well. 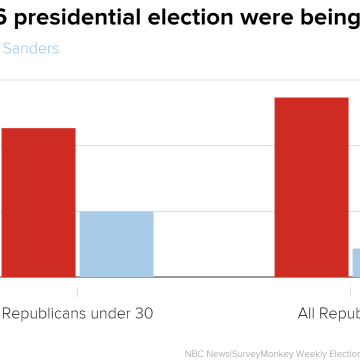 About 30 percent of Republicans and Republican-leaners under 30 would vote for Sanders over Trump. The support Sanders gains among young Republican is surprising as research has consistently shown that party identification is the strongest predictor of vote choice. When faced with a Clinton-Trump ticket, 18 percent of Republican and Republican-leaning voters under 30 would support Clinton; 78 percent would support Trump. Appealing to unaffiliated and undecided voters is essential as campaigns start to pivot toward the general election. There is much higher turnout among these voters in the general election than the primary contests for several reasons, including the fact that some state-specific rules make it more difficult for Independents to vote in primary contests. 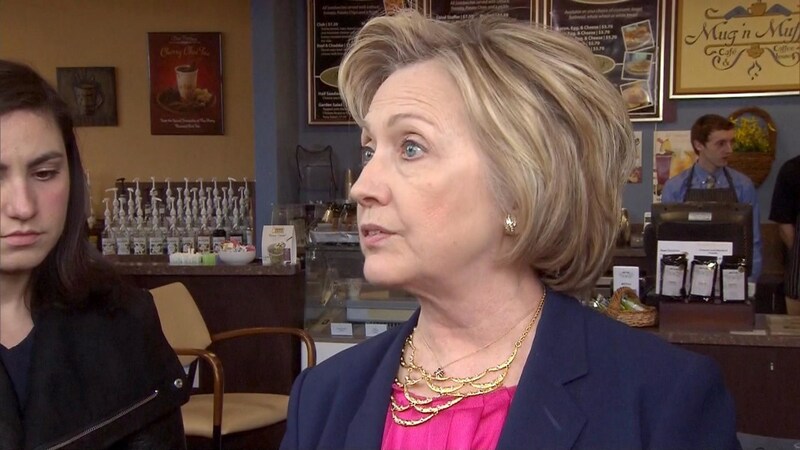 These “swing voters” can significantly impact the outcome of the election. When analyzing this week’s theoretical general election match-ups, Sanders gets much higher support from Independents than Clinton when faced with a Trump alternative. A small majority of Independents — 52 percent — would pick Sanders over Trump (30 percent). When asked who they would support in a Clinton vs. Trump match-up, Independents were much more divided over their choices; 37 percent would vote for Clinton, while 39 percent said they would support Trump. Though there are still a number of months left before any votes are cast this November, an analysis of each candidate’s strengths and weaknesses offer early insights into where campaigns should focus their efforts in the coming months. 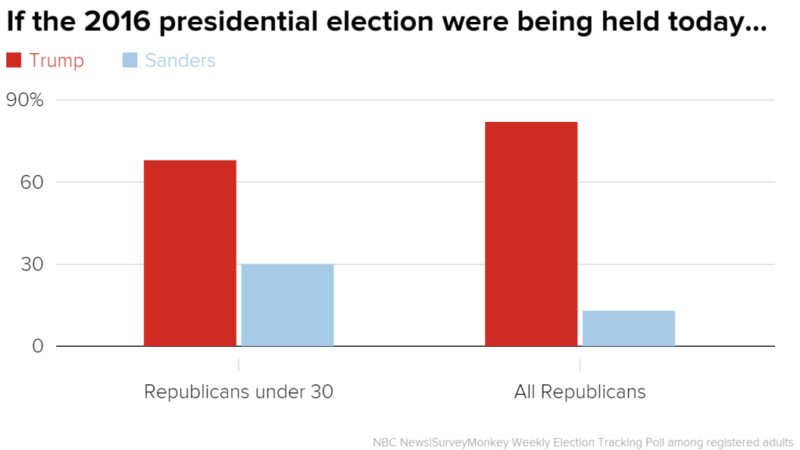 The NBC News|SurveyMonkey Weekly Election Tracking poll was conducted online May 2 through May 8, 2016 among a national sample of 12,714 adults aged 18 and over, including 11,089 who say they are registered to vote. Respondents for this non-probability survey were selected from the nearly three million people who take surveys on the SurveyMonkey platform each day. Results have an error estimate of plus or minus 1.3 percentage points. For full results and methodology for this weekly tracking poll, please click here.